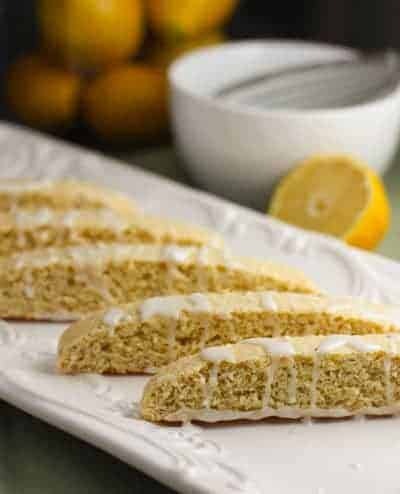 We love this Lemon Biscotti recipe! Easier to make than cookies. Tender on the inside and crunchy on the outside. So good with a cup of tea and also make wonderful gifts! ‘Summer time…and the lemon is easy…. ‘ Oh I do love cookies and summertime and lemon and biscotti! My second Biscotti posting in the last few months – what can I say? I think it’s the perfect cookie! My last shared recipe of Double Chocolate Almond Biscotti left me with a craving for more…more cookies please! These are low fat, low calorie and pair wonderfully with your favorite tea. They are also super easy to make and totally shareable! So what’s not to love? Cookies + Sharing = Love Love and cookies….rainbows and unicorns…okay, getting schmaltzy now….time to just shut up and give you the recipe! 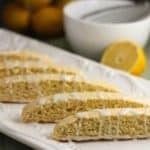 An easy to make Biscotti recipe that you will love! 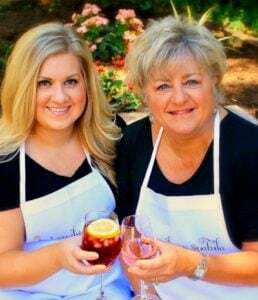 Easier than cooked and makes a great gift! Preheat the oven to 350°F. Lightly grease (or line with parchment) one large baking sheet. In a medium-sized bowl, beat the butter, sugar, salt, lemon rind, almond extract, and baking powder until the mixture is smooth and creamy. Beat in the lemon juice and eggs; the batter may look slightly curdled. At low speed of your mixer, add the flour, stirring until smooth; the dough will be sticky. Plop the dough onto the prepared baking sheet. Shape it into a log that’s about 13" long x 3" wide x 3⁄4" thick. Straighten the log, and smooth its top and sides; a wet spatula or wet bowl scraper works well here. Bake the dough for 25 minutes. Remove it from the oven, and allow it to cool on the pan anywhere from 10 to 25 minutes.. Reduce the oven heat to 325°F. Using a spray bottle filled with room-temperature water, lightly but thoroughly spritz the log, making sure to cover the sides as well as the top. Softening the crust just this little bit will make slicing the biscotti much easier. Wait another 5 minutes, then use a serrated knife to cut the log crosswise into 1⁄2" slices. Set the biscotti on edge on the prepared baking sheet. Return the biscotti to the oven, and bake them for 30 to 35 minutes, till they feel very dry and are beginning to turn golden around the edges. Remove the biscotti from the oven, and transfer them to a rack to cool. Keep in mind that they will harden while cooling so careful not to cook until crispy! The glaze doesn’t seem to be thick enough and the cookies absorbed it almost immediately. I waited almost two hours after taking them out of the oven before trying to ice, so I know they weren’t still too hot. The cookies themselves came out less than I expected. I added a lot more lemon juice and swapped the almond extract for lemon extract and still I can barely taste the lemon in the cookie. I don’t really think it’s the recipe’s fault, but I’m not sure how to make the lemon flavor really punch. Otherwise I’m pretty happy with the outcome. Next time I’m going to make a double batch and add even more lemon. Hi, I was wondering how many cookies this would yield approximately ? 24! Sorry, I left off the servings. I’ve updated the recipe! This tastes good but I probably wouldn’t make it again. My biscotti got a little soft after I drizzled the lemon glaze. My glaze did not turn out as thick as yours – pretty sure I followed the measurements exactly. It was easy to fix by adding more icing sugar but I didn’t really want to do that. They also came out of the oven with golden brown edges – they were not over-baked. I would have preferred if they came out just lemon-y yellow for aesthetic reasons. My oven is the culprit for this – it’s a new oven that I’ve noticed bakes most things faster and I forgot to adjust the bake time accordingly. I just love biscotti’s! Anytime a cookie is perfectly acceptable for breakfast is a total winner for me! Love the lemon glaze on this. Yum! I hope you do Anne! I’m making your Chipotle Salmon!